To tide us over until December’s Assassin’s Creed movie and 2019’s Indiana Jones V, the David Koepp-penned Inferno is the third film to feature Tom Hanks yelling about paintings whilst running around old European buildings with a much younger woman in tow. Annoyingly for all of us who mentally waded through ‘The Lost Symbol’, this third Robert Langdon film is based on the fourth book in the series, appearing on our screens seven years after Angels & Demons, the second film (but first book) in the series. Phew. So what’s changed? Not that much. Whilst the plot concerns events of titanic proportions – Langdon out to stop the spread of a virus that will annihilate a good portion of the Earth’s population – the film feels even more contained than Angels & Demons. Considering the epic nature of The Da Vinci Code‘s conspiracy, the cinematic sequels have always felt underwhelming. As with the first two films, it’s clear that expository dialogue works better in book form. Once again, Hanks is forced to lead a whistle stop tour through various museums whilst the film’s editor does his best to make looking at statues and paintings for clues exciting. He’s accompanied this time by the-woman-who-would-have-been-Blackcat, Felicity Jones. The pairing isn’t as successful as that of Hanks and Tautou in the first film, and we’re never given a good enough reason as to why this nurse, Sienna Brooks, simply in the wrong place at the wrong time, would be so willing to help Robert. Even more disappointing is the fact that the supporting cast fail to make any great impression. Omar Sy, Ben Foster (playing a crazy guy? No way! 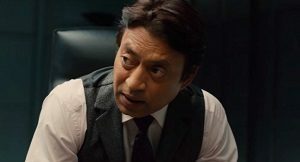 ), Sidse Babett Knudsen and Ana Ularu are all bland and forgettable, with Irrfan Khan being the only actor to really impress. His enigmatic Provost is effortlessly amusing and disturbing, and Khan is surely an actor that’s next in line to play a Bond villain. Hans Zimmer’s score seems to eschew traditional instruments in favour of an almost purely synth sound. At first this bothered me, but by the time the glorious climactic track appeared – ‘The Cistern’ – I was once more in musical heaven. There’s nothing that you haven’t heard from Zimmer in the past ten years here – including Inception BRRAAWWRNWMMMMS – but it worked for me. As a high-paced thriller, Inferno works well enough. There are a couple of embarrassingly contemporary narrative beats, like Langdon being tracked through a park by a remote control drone, or Sienna accessing a share car via swipe card. The only other interesting element of note would be arguably the best Stygian vistas we’ve seen since 2005’s Constantine. Don’t expect too much and you mightn’t be disappointed. This entry was posted in Film Reviews and tagged Action/Adventure, Mystery, Thriller by Stuart Wilson. Bookmark the permalink.